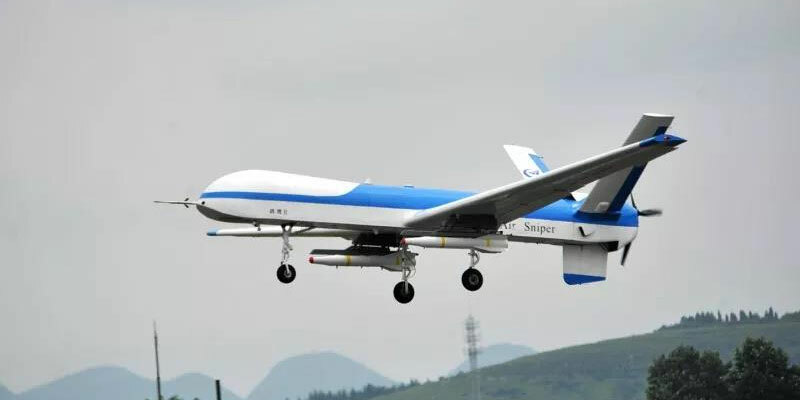 The Guizhou Aircraft Industry Corporation (GAIC) has staged the first flight of the Yaoying II UCAV. This is the third Chinese aerospace entity to confirm the flight of a UCAV, following the China Aerospace Science and Technology Corporation (CASC) and the Chengdu Aircraft Industry Group (CAIG). An unarmed version of the Yaoying made its first flight in the third quarter of 2016, equipped with an imaging reconnaissance radar in an underbelly pod. The name Yaoying translates as Foal Eagle, though other media have used the term Harrier Hawk. Adding to the confusion, photos that have emerged of the new UCAV making its first flight from GAIC’s Anshun airfield on July 3 show the name “Air Sniper” in English painted on the fuselage. The photos suggest that the Yaoying II has two underwing pylons carrying the AKD-9 anti-armor missile, and another centerline pylon that was not in use. The Yaoying II has a maximum takeoff weight of 1,280 kilograms, a cruise altitude of 23,000 feet, and a cruise speed of 116 knots. Endurance without payload is around 32 hours. Chinese media noted that this UCAV, like its predecessors from CASC and CAIG, will be ready for export and could be customized for various requirements. Like CAIG, GAIC is a subsidiary of the state-owned Aviation Industry Corporation of China (AVIC). About a dozen countries in the Middle East, Africa, and Asia have already bought Chinese UAVs in the CH- and Wing Loong series that can be armed.